Seventy years ago, on Dec. 1, 1948, Costa Ricans stood arm in arm to say goodbye to a history of violence and war: We abolished our army as a nation forever. Instead of a military parade where soldiers march brandishing their guns and artillery, our national celebrations are marked by children and youths carrying the Costa Rican flag, colorfully dressed in school uniforms. The decision has allowed the force of reason to guide our history, freedom and democracy. We are confident that it was an extraordinary step we took to make Costa Rica a fairer and more enlightened society. No doubt we have reaped the benefits of the decision in a myriad of ways. As opposed to splurging on weapons of destruction, we have focused on human development and come a long way as a peaceful, democratic, equitable and ecological nation. This was only possible because we were able to use the resources that would otherwise be spent on weapons for the greater good and well-being of our society. That fundamental choice was later enshrined in our 1949 Constitution. It has forged the identity of generations of Costa Ricans born and raised on home soil free from any military tank or plane. Costa Ricans would never take pride in owning a rifle or dying on a battlefield. Through the rejection of violence as a means of settling disputes, Costa Rica embraced international law, safeguarding its national interests, sovereignty and the rule of law. To this day, we firmly believe in and adhere to all aspects of international law, convinced that it is the right path and one that will take us to continuing prosperity and development. Our strength has always been, and will always be, grounded in international law. The abolition of the army also comes from a long tradition of a peaceful, unarmed country since 1877, when we put an end to the death penalty. We have instead embarked on a path of peaceful coexistence among nations. This is reflected in different proposals that Costa Rica leads on today’s international stage, including the Treaty on Arms Trade, an international legal instrument that requires states to comply with strict regulations to ensure that arms transfers do not lead to violations of human rights; and the Treaty on the Prohibition of Nuclear Weapons, the first legally binding international agreement to comprehensively prohibit nuclear weapons with the goal of their eventual elimination. Costa Rica shares with the world a determination to part ways with arms and a vision of universal peace and security -- the hallmarks of our foreign policy. Seventy years ago, our parents and grandparents made a sagacious judgment. 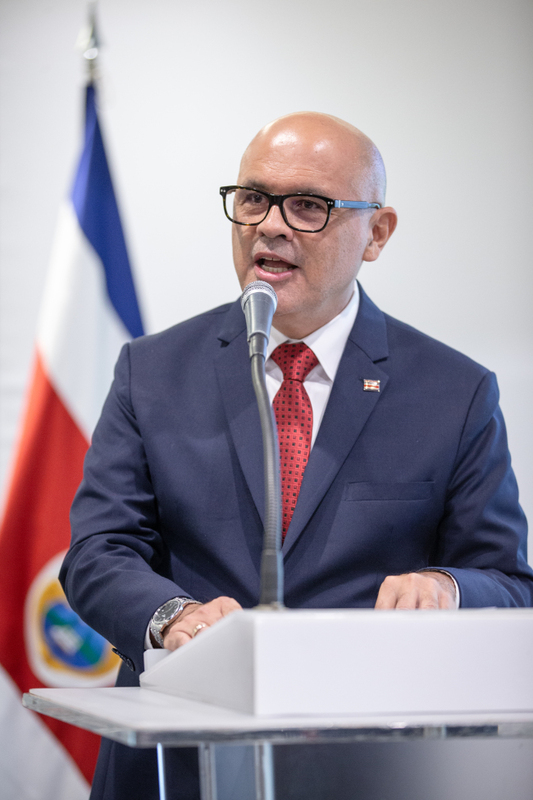 Moving forward, our present-day Costa Ricans, led by President Carlos Alvarado Quesada, carry on the olive branch for our generations to come. At the same time, our vision is guided by a commitment to become the world’s first decarbonized economy and society. The world’s collective future will be buttressed by the Costa Rican efforts to end the use of fossil fuel in our lives and businesses.